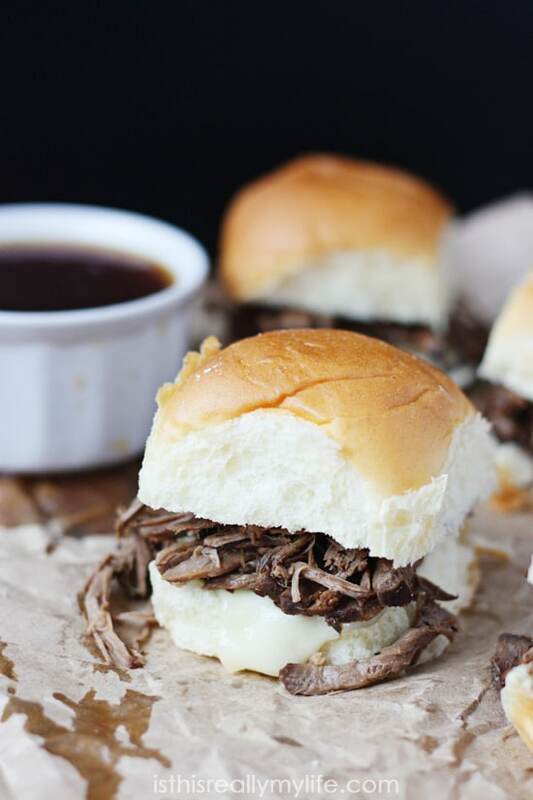 These slow cooker French dip sliders are super easy to make and the mini size is super fun for kids (and adults) to eat! I have a very ghetto way of making French dip sandwiches so I thought I’d kick it up a notch and go all fancy with these slow cooker French dip sliders. I found this slow cooker French dip sandwich recipe from Cooking with Ruthie and adapted it slightly. (I don’t like a strong rosemary flavor to my French dip.) And instead of hoagie rolls I went with those delicious Hawaiian sweet rolls. Mini sizing a meal is always a hit with the family. 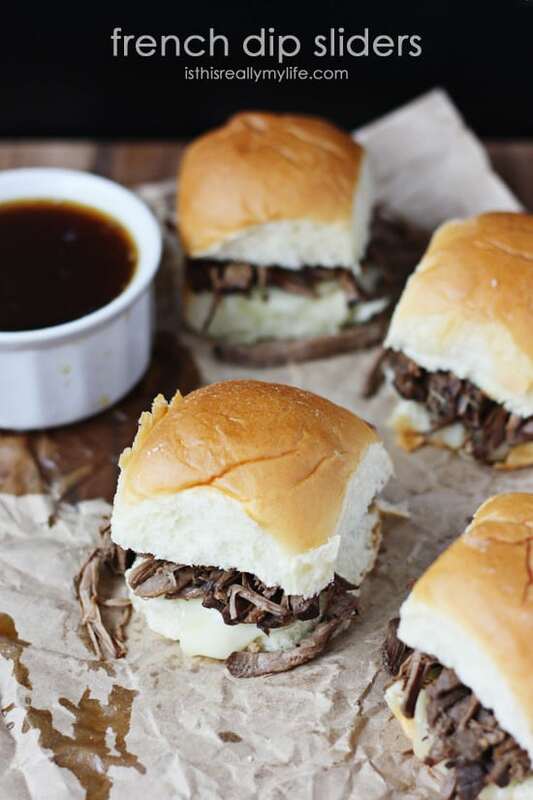 Throw in a bowl of au jus hot from the slow cooker and you’ll be surprised how many of these sliders you manage to eat without the aid of stretchy pants. Speaking of slow cookers, this programmable slow cooker is on my wish list! 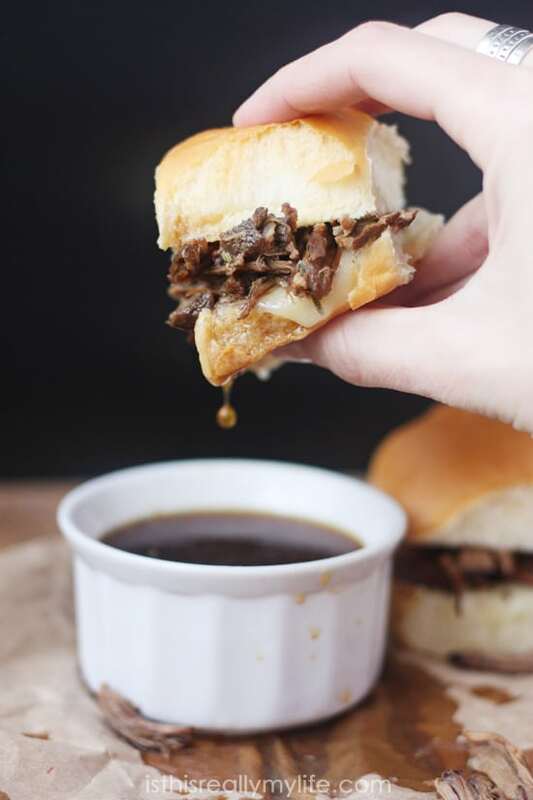 Printable recipe for French dip sliders below. Enjoy! Place roast in slow cooker fat side up. Combine remaining ingredients in small mixing bowl. Pour over roast. Cook on high for at least 6 hours. Scrape off fat from meat and discard. Shred roast and return to slow cooker for 30 minutes. Remove bay leaf. Strain remaining liquid to remove rosemary and peppercorns (optional). Reserve strained juice for au jus dipping sauce. Slice rolls and place half slice of provolone on each roll. Top with shredded meat. Serve on sweet Hawaiian rolls or your favorite slider rolls with a side of au jus. I didn't love the pieces of rosemary in my shredded meat so I prefer to use a strainer to remove them, but you can skip this step if you'd like! If you’re looking for more yummy slow cooker recipes, you should browse my slow cooker recipes board on Pinterest. Follow Emily Hill’s board slow cooker recipes on Pinterest.